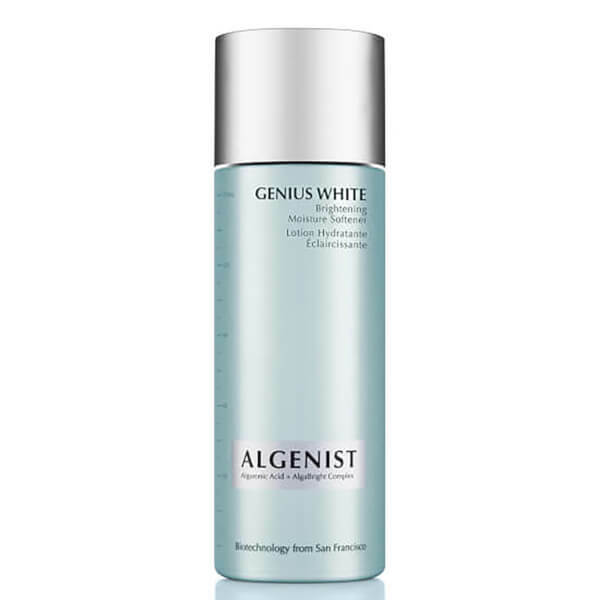 The ALGENIST Genius White Brightening Moisture Softener Toner helps to combat dullness and sallow skin with a selection of powerful biotechnological ingredients that intensively hydrate and revitalise. Gentle enough for all skin types, the refined formula balances age-defying extract of Alguronic Acid with an exclusive AlgaBright Complex, which work in tandem to soothe and purify without disrupting skin’s natural moisture levels. 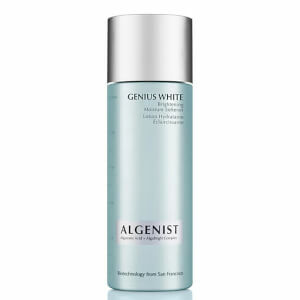 Non-abrasive brightening agents help alleviate the look of discolouration and dark spots including sun damage, while the appearance of fine lines are smoothed. Ideal for sensitive skin, it leaves your complexion feeling soft and supple with a more even and luminous tone. Use daily after cleansing, before applying moisturizer. Using a cotton ball to apply the lotion gently cover entire face, neck, and décolleté. Use only as directed. Water (Aqua), Pentylene Glycol, Ethoxydiglycol, Algae Exopolysaccharides, Ascorbyl Glucoside, Niacinamide, Caprylyl Glycol, PEG-40 Hydrogenated Castor Oil, Ethylhexylglycerin, Algae Extract, Hexylene Glycol, Acrylates/C 10-30 Alkyl Acrylate Crosspolymer, Camellia Japonica Seed Extract, Bis-PEG-18 Methyl Ether Dimethyl Silane, PEG-12 Dimethicone, PEG-12, PEG-12 Monoallyl Ether, Biosaccharide Gum-1, Glycerin, Citrus Aurantium Tachibana Peel Extract, Sodium Hydroxide, Methyl Lactate, Butylene Glycol, Citrus Depressa Peel Extract, Tocopheryl Acetate, Phenoxyethanol, Fragrance (Parfum), Linalool.